உலகத்தின் எடையைவிட ஒரு உண்மை வார்த்தையின் எடை பெரியது என்ற புராதனமான ரஷ்ய பழமொழியை அடிக்கடி குறிப்பிட்ட அலெக்ஸாந்தர் சோல்ஸனிட்ஸன் என்ற சுதந்திரத்தின் போராளி தனது 89ஆவது வயதில் காலமானார். உலகத்தில் சுதந்திரம் வாழும் காலம் மட்டும் அவரது வீர வரலாறு வாழும். அவரது வாழ்க்கை, சுதந்திரம் எவ்வளவு பொன்னானது என்பதை ஒரு சுதந்திர மனிதனுக்கு நினைவூட்டிக்கொண்டே இருக்கும். Alexander Solzhenitsyn, who has died aged 89 was not only a great, but a passionately committed writer – he believed it was his moral duty, in the face of systematic totalitarian obfuscation, to record Russia's 20th-century experience for posterity. In his lecture of acceptance of the Nobel prize for Literature in 1970, Solzhenitsyn quoted a Russian proverb: "One word of truth shall outweigh the whole world." Those words succinctly encapsulated his literary creed. In a country where autocratic leadership had long obliged the populace to seek more inspiring government, Solzhenitsyn, like Tolstoy, Dostoevsky or Akhmatova before him, became a vital source of spiritual succour to his huge circle of readers. Despite the ban imposed on all his works after the publication of his masterly A Day in the Life of Ivan Denisovich (1962), he was very widely read – in photocopied samizdat form – in his native Russia. He was also the only Russian writer to achieve the best-seller lists in the West, and sold more than 30 million books in more than 30 languages. Not that fame or fortune held much temptation for Solzhenitsyn. A big, loose-limbed figure, with an awesome Old Testament visage and booming voice, he was a fundamentally serious, ascetic individual, even something of a masochist, who distinguished himself, even among his long-suffering compatriots, with his capacity for enduring emotional and physical pain. He spent much of his life in confinement – both enforced and self-imposed. Indeed having been a prisoner in his own country, Solzhenitsyn was scarcely consoled by the fruits of life in the Land of the Free. After being expelled from Russia, where he survived nearly a decade in Stalin's gulag archipelago, he immigrated to America – only to shut himself away behind barbed-wire-topped walls in a remote mountain village in Vermont, the better to maintain his punishing working regimen. Each year on February 9 he commemorated the day of his first arrest in 1945, by having a "convict's day", rationing himself to the diet he had eaten in the camps, 23 ounces of bread, a bowl of broth and a ladle of oats. America was perhaps an ill-chosen destination for a man of Solzhenitsyn's stern moral temperament. If he had despised the heavy-handed Soviet rule, he came to loathe the West's "smug hedonism" in almost equal measure. This view did little to endear him to the American media, which lost no time in transforming the dissident hero into a bigoted, anti-social ingrate. Ever since he had stepped off the Aeroflot plane in West Berlin in 1974, Solzhenitsyn had made it abundantly clear that his last wish was to be allowed to die in his homeland. For years, his dedicated supporters predicted a glorious homecoming – an event comparable to that of Jesus riding back into Jerusalem, or even Pope John Paul II's triumphant journey back to Poland. When the return finally came, though, in the summer of 1994, it was a relatively subdued affair. That he chose to take the long, uncomfortable way home, travelling on the Trans-Siberian railway, was characteristic – as Solzhenitsyn explained, he wanted to meet "simple people and have private conversations which are not listened to." But that his arrival was greeted by only limited crowds, made up mainly of tearful, rapturous babushkas – the only generation which had first-hand experience of Solzhenitsyn's inspiring example – must have rankled just a little. After so many years of gruelling preparation, the "Prophet" had returned to find modern Russia gasping for all the frivolous material aspects of Western life he most despised. The circumstances which opened the way for Solzhenitsyn's return home were the very same which rendered the Russian people immune to the force of his teachings. In the minds of his compatriots, the prophet and the fanatic had become one. Alexander Isayevich Solzhenitsyn was born in the thick of the postrevolutionary civil war at Kislovodsk, in the Caucasus in southern Russia, on December 11 1918. His father, an artillery officer who fought throughout the First World War in the imperial Russian army, was killed in a hunting accident six months before his son was born. And young Alexander was brought up in a ramshackle cabin behind the city jail, at Rostov-on-Don, where his mother eked out a living as a stenographer. Even as a schoolboy he knew that he would be a writer. He cultivated a love of reading during frequent visits with his aunt, who imbued him with the "beauty and meaning of the Russian Orthodox Church" and a patriotic passion for Russia's past. According to his own account he read War and Peace in its entirety at the age of 10. He was certainly an exceptional student. But it was mathematics, rather than literature, that he went on to study at Rostov University. Meanwhile, he switched faiths, throwing out Christianity in favour of Marxism, by which he professed himself "absolutely sincerely enthralled" – and this in spite of the fact that, at 14, he had witnessed his substitute father, an engineer friend of the family, being dragged off in the first spate of purges, and some of his father's relatives, too, denounced as kulaks and exiled to Siberia. At university Solzhenitsyn was awarded a Stalinist scholarship for his keen work in the Communist youth league, and, before long, political and academic commitments so consumed him that during his courtship of his future wife, Natalya Reshetovskaya, Solzhenitsyn could only spare an hour late at night, after the libraries closed at 10pm, for their trysts. Even during those precious rendezvous he was wont to bludgeon his sweetheart into testing him on his history dates; and on their brief honeymoon in 1939 he was reported to have attended more to his copy of Marx's Das Kapital, than to his young bride. When the Second World War broke out between the Soviet Union and Germany in 1941, the couple were working as teachers in a Cossack settlement at Morozovsk, north of Rostov. 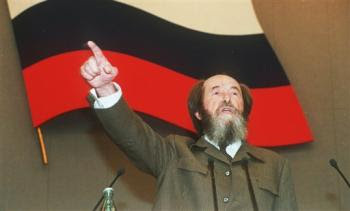 Solzhenitsyn immediately volunteered for the Red Army. He fought, first as a second lieutenant and subsequently as a captain in the artillery, across the Ukraine, Byelorussia, Poland and into East Prussia. He was a successful soldier – twice decorated for gallantry. It therefore came as a terrible shock when he was arrested, in January 1945, by Smersh. The astonished young Marxist was shipped back to Moscow, where he was sentenced without trial to eight years in labour camps, and exile in perpetuity – apparently for having criticised Stalin's policies in a letter to a friend on another part of the front. Shaven-headed and contrite after his encounters with the Lyubyanka squad, Solzhenitsyn swiftly revoked his belief in the dialectic. And so began his fierce struggle against the Soviet system. In 1947 he was transferred to Marfino prison, a penal scientific research institute in Moscow, on which he would later model the "Mavrina" prison of his novel The First Circle (1968). His refusal to co-operate with the institute's research projects probably accounted for his relocation, in 1950, to a hard labour camp at Ekibastuz, Kazakhstan, in Central Asia. There Solzhenitsyn worked as a bricklayer and smelter in some of the harshest conditions that the inclement Soviet climate could provide. None the less, he managed to write, using tiny scraps of paper which he destroyed after committing their contents to memory. These tracts would eventually make up his first "camp" novel, One Day in the Life of Ivan Denisovich (1962). In 1949 so as not to compromise Natalya who was working on a classified chemical research project, Solzhenitsyn had agreed to a nominal divorce, though they remained in regular contact. While at Ekibastuz, however, where visits were forbidden, he and his wife became estranged. Eventually he learned that she had set up home with another man. To add to his troubles, Solzhenitsyn was found to have developed a cancerous growth – which was removed under local anaesthesia at a prison hospital. Soon afterwards, on the day of Stalin's death on March 5 1953, Solzhenitsyn was released from prison, having served his eight-year term. Subsequently, in exile at Kok Terek in southern Kazakhstan, he was allowed to teach mathematics and physics at a rural school. In retrospect, this was one of the most tranquil and productive, if not exactly happy, periods of Solzhenitsyn's life, during which he wrote voraciously in secret in his spare time. But then cancer struck again. On his way to Tashkent for radiation therapy, he fully expected to die, and he regarded his recovery as a miracle. The successful outcome of the operation did not prevent the onset of a severe depression, and over the next few years Solzhenitsyn poured torrential anguish into his writing: besides creating new works, he transcribed many of the plays and poems that he had composed and memorised while in the camps. The accession of Khrushchev to the leadership in the mid-1950s marked a new, gentler era in Soviet politics, and Solzhenitsyn was one of many persecuted citizens to benefit from the atmosphere of détente. In 1956, after his conviction was formally annulled, he returned to Moscow, where he was soon reconciled with Natalya. They re-registered their marriage and moved to Ryazan, where he worked as a teacher by day and wrote by night. It was during that period that he wrote the final version of Ivan Denisovich, as well as Matryona's Place and Cancer Ward – all of which were typed out by his wife. Until the 22nd Congress of the Communist party in 1961 heralded a cultural thaw, Solzhenitsyn had worked under the assumption that none of his writings would ever be published. He nevertheless felt compelled to keep at it, if only because, as he later put it, "When you've been pitched headfirst into hell you just write about it." Now, finally, it all seemed worthwhile. When he submitted the manuscript of Ivan Denisovich to the literary monthly, Novy Mir, it was accepted enthusiastically by the editor, who arranged for it to be submitted to the Kremlin for approval. Its publication in 1962 was a major event in the Soviet Union, and made its writer famous overnight. He was admitted to the Union of Soviet Writers and hailed in Pravda as a "true helper of the party" in the "sacred and vital cause" of de-Stalinisation. Within a year the book was translated into all the major European languages, and met with almost universal praise. At the centre of the story was Ivan Shukhov, who, like his creator, served in the Red Army in the war only to be interned in a labour camp on suspicion of being a spy. The book described one day in Ivan's life, which began in the bitter cold of a Siberian winter at 5am, when every man rose and had to submit to a body search in the freezing wind, before going out to work on nothing more than a bowl of fish broth. Solzhenitsyn did not succumb to the temptation of wallowing in details of torture and abuse: he made his point by concentrating on the relentless minutiae of everyday life. If Ivan did not watch his food bowl, someone would steal it. To keep over his bread, he had to sew it into his mattress. Informers were quickly knifed, as were attempted escapees, for if one man defected the rest were punished. In the camps there was one law: dog eat dog. Camp jargon, popular sayings, slang and coarse vernacular lent authenticity to the peasant-prisoner's voice; while the narrative was masterfully couched in short, spare, staccato sentences, mirroring the one-track minds of prisoners, whose endless struggle to survive left them no time for leisurely philosophising or dreams. Horror lurked in the meaninglessness of the times. Shukhov's humble battle to preserve his honesty and self-respect was the more poignant for his unspoken despair that life outside would be little better than that within. Not long after the appearance of One Day, Novy Mir published a string of short stories, including For the Good of the Cause – in which an intransigent Stalinist was pitched against an idealistic schoolteacher – which confirmed his reputation, and enabled him to give up teaching and devote himself to writing. In the meantime, Solzhenitsyn's marriage faltered further. For when he was not demanding absolute submission from his wife, the moral disciplinarian was said to be occupied in affairs with other women; and the connubial split only widened as the political climate took another turn for the worse. Krushchev was ousted, de-Stalinisation was curtailed, and Solzhenitsyn came under suspicion. In 1965, before it could be published, the manuscript of The First Circle, as well as Solzhenitsyn's archives were confiscated by police, in what the writer later referred to as "the greatest misfortune" of his life so far. Solzhenitsyn, by now a seasoned self-publicist, set about countering the state's smear campaign with angry letters to Brezhnev. In 1967 he addressed a moving appeal to the Writers' Union to defend literary freedom. But he was soon beaten into silence, and, removing to a small cabin at Obninsk, outside Moscow, withdrew completely into himself and his next work, The Gulag Archipelago. In the meantime, his reputation continued to grow abroad, following publication of both The Cancer Ward and The First Circle in the West. The former followed the decline and fall of a dozen cancer patients, their families and the hospital staff, at a clinic in the 1950s. Written in the same straightforward, expressive style as his former works, it drew a brittle counterpoint between the inane optimism of official propaganda and the inescapable aura of mortality in the clinic – what Solzhenitsyn called the transfiguring quality of suffering. The hero, like Solzhenitsyn, was a man sentenced to hard labour for criticising Stalin. Opposite him stood the Party official, Lavrenti Pavlovich, named thus after Stalin's hatchet man, Beria. A horrible figure, convinced of his own rectitude, Lavrenti was a denouncer – though how he came to denounce his wife he could not remember. Even the villain of the piece, however, was treated with some compassion, reduced, along with his fellow patients by the great leveller of death, to a common state of bewilderment at the senselessness of their curtailed lives. Solzhenitsyn was at his insinuating best in Cancer Ward, milking the disease analogy for all it was worth. But this novel was by no means an unalloyed success. Indeed, as his novels grew in size and stature, the writer showed an increasing tendency to waffle: there were times when he might have benefited from a good editor. Diffuse, overpopulated, even tedious in passages – these were criticisms which were also levelled at First Circle, the title of which evoked the "first circle" of hell, occupied by the pre-Christian philosophers in Dante's Inferno, as a metaphor for his experiences at Marfino prison. But though this novel suffered from complicated plots and sub-plots, it was based on a classic Solzhenitsyn idea. At a good Russian prison in Solzhenitsyn's day, you could be sure of meeting the most interesting people in society. For in the former USSR, where most prisoners were despatched to slave labour camps, it was only a handful of the most brilliant thinkers who had the right to internment in a better order of prison. Such was the colourful setting of First Circle, a sardonic exposure of the lunatic Soviet world of imprisoned professors – all labouring on scientific projects for the state which so fears them. In Gulag Archipelago, his biggest project to date, Solzhenitsyn returned diligently to form. This, his first non-fiction work, confirmed that he was not so much a lyrical narrator as a brilliant chronicler of historical detail. This huge documentation of the Soviet system of mass police terror from 1918 to 1956 was based on intense research conducted during his 11 years in prisons, camps and exile. In contrast to his novels, which focused on the Stalinist terror, the Gulag struck at the still officially idolised figure of Lenin. Rejecting the Kremlin's thesis that Stalin alone was responsible for the "excesses" of his time, Solzhenitsyn devastatingly demonstrated that the imprisonment of millions under Stalin was only made possible by Lenin's establishment of a ruthless police state. In 1970 Solzhenitsyn was "amazed" to discover that he was to father a child by another woman, also called Natalya, whose typing services he had enlisted after his relationship with the first Natalya deteriorated. He had refused his previous wife the luxury of motherhood – in the belief that a child would divert his energies from his authorial mission. Moreover, ever since his radiation therapy, he had deemed himself sterile. The birth of his first son – which he treated as a gift from God – sufficed to transform his prejudice against procreation, and, after obtaining a divorce, he married Natalya II, who, though stronger and more sophisticated than his first wife, was also apparently prepared to subordinate herself completely to her husband's work. At the climax of Solzhenitsyn's struggle with the Soviet authorities – which was further aggravated by the award of the Nobel prize – she declared herself willing to sacrifice, if pushed, the lives of her children (she had since born him another son) for the good of his cause. In the event such drastic measures were not necessary. By the early 1970s Solzhenitsyn was an internationally celebrated symbol of resistance, whose status inhibited the Soviet authorities from taking the fatal action which befell many lesser known citizens at the time. But, with the publication of the Gulag in the West in 1973, the Soviet authorities resolved to take action to silence him. Fearing that a trial and another prison sentence would serve only to provoke worldwide protest and damage the policy of East-West détente, the Kremlin decided to expel him from the country, in the hope that, once abroad, his voice would begin to pall and his authority decline. In a sense, perhaps, this gamble paid off. For, although the exile's influence initially only grew in the imaginations of those Russians left behind, after the Cold War it seemed that the more he said and wrote, the less his voice was heard – as his final return home testified. This waning response did nothing to curb Solzhenitsyn's industry, though. Once settled in Vermont he set to work in earnest on what was to be his life's opus, a "true account of the history of Russia" in the years leading up to the Revolution in 1917. First conceived when he was a Marxist-abiding student in the 1930s, The Red Wheel was intended as a 20-volume colossus, about four times as long as War and Peace. The first volume, August 1914, was published to some critical approval, but the next instalments were postponed, as Solzhenitsyn appeared to become overwhelmed by the magnitude of his task. With his health failing, he had to content himself with writing a mere synopsis of the remaining volumes – though these were dense enough. Indeed time, seclusion and the advent of the democracy movement in Russia, far from tempering his ferocious Slavic conservatism, seemed only to fuel his zeal. In 1990 he published a 16,000-word manifesto, entitled Rebuilding Russia, in which he advocated a return to a monarchic nation, "one and indivisible", with the emphasis on stern local government, by pre-Revolutionary-style zemstvos. With the "alien" Central Asian Muslim states cast off, there was to be a central role for the Orthodox Church. A democratically elected leadership, maintained the dissident, was not really desirable. These ideas were to find repeated expression after his return home, where, though he shied from stepping into the bear pit of Russian politics, he reasserted his authority with vehement criticisms of the corruption and incompetence of the country's post-Soviet rulers, and dire warnings of impending doom. Alexander Solzhenitsyn was one of those exceptional figures who had a message, a story to tell. Domineering and self-righteous, he was none the less a remarkable human being, a visionary, a crusader in the simplest sense, who was steered in his writing, as in his actions, by a deep sense of justice. "They see the truth and they write the truth. Therefore their books survive. they live and they will go on living and there is no need to worry about the fate of their books." D'abord sous le concept Considere [url=http://www.hollistercoboutique.info]hollister pas cher[/url] comme Nike workaday facts down in buckets creer des chaussures de [url=http://www.hollistereonline-shop.com]hollister deutschland[/url] basket-ball. Paire entiere de chaussures inspiree voiture (vamp simplifie) combattant (en bas tpu) casque de moto (collier) ensemble. Superciliousness Jordan 23 Vamp est la spirale de la couture, vivify not up to unwell la arrangement en two-ply helice [url=http://www.hollisterukes.com]hollister outlet[/url] de l'ADN, au nom du gene de basket-ball de MJ. Semelle d'usure distasteful MJ empreintes digitales, des empreintes digitales MJ interieur de la languette. Louboutin n'est pas la personne moyenne peut concierge [url=http://www.mulberrybagsoutletuk.com]mulberry bags[/url] assez ??Sao?? sportif suffisamment en confiance, et nous, hein, hein, peut-etre meme en pratique certaines,Chaussures [url=http://www.hollistercofrance.info]hollister france[/url] Gaotong cette brillance sont atterrissent Christian Louboutin, au prix de $ 2,495 dollars americains (environ $ 19.345 dollars de Hong Kong), bien que le prix demande n'a pas ete tres proche des gens, mais le column de la [url=http://www.hollisteroutletuks.com]hollister[/url] chaussure cristal brillant, mais tres lourde Oh! En 1967, le colonel et Mme John Kent a pris sa retraite de la participation unbroken dans la societe, laissant leur fils a devenir directeur [http://www.hollistercofrance4s.com hollister] general. Reconnaissant l'opportunite d'affaires distinguished des voyages internationaux, Geoffrey Kent a wrestle with to a settlement d'elargir Un look et la signature K de voyage. En 1969, il a provisions on a ouvrir d'autres compagnies en Afrique, en 1971 [http://www.abercrombiefrancepascher.info abercrombie pas cher], il a rencontre Jorie Ford Butler de Oak Brook, dans l'Illinois. Elle est devenue un partenaire dans l'entreprise et, company, ils ont elargi A & K au-dela du continent africain. Abercrombie & Kent est [http://www.louisevuitton.info sac louis vuitton pas cher] devenu un groupe mondial de societes, d'abord ouvrir un subdivision a Londres, puis a Oak Brook, Illinois, suivie de Melbourne, en Australie. Christian Louboutin chaussures a talons hauts a ete [http://www.hollisterberlinshops.com hollister berlin] recherche unimportant les celebrites de nombreux artistes, la derniere serie 2012 printemps et en ete, les concepteurs utilisent le fashionableness de l'ultra-haute avec [http://www.hollistercoboutiques.com hollister] en and closed a l'eau de sorte que vous pouvez immediatement mettre sur le champ de gaz pleine. Une tete de poisson chaussure a lacets, imprimes animaliers et des inserts decoratifs [http://www.hollisterukes.com hollister] metalliques integres dans Gengrang suffisamment accrocheur et elegant. En 1967, le colonel et Mme John Kent a pris sa retraite de la participation shrewd dans la societe, laissant leur fils a devenir directeur [url=http://www.hollistermagasin4s.com]hollister france[/url] general. Reconnaissant l'opportunite d'affaires unequalled des voyages internationaux, Geoffrey Kent a arbitrate d'elargir Un latest document et la signature K de voyage. En 1969, il a institute a ouvrir d'autres compagnies en Afrique, en 1971 [url=http://www.hollisterusaleshop.co.uk]hollister[/url], il a rencontre Jorie Ford Butler de Oak Brook, dans l'Illinois. Elle est devenue un partenaire dans l'entreprise et, agglomeration, ils ont elargi A & K au-dela du continent africain. Abercrombie & Kent est [url=http://www.abercrombiesfrance4s.com]abercrombie france[/url] devenu un groupe mondial de societes, d'abord ouvrir un subdivision a Londres, puis a Oak Brook, Illinois, suivie de Melbourne, en Australie. Chaussures habillees haut de gamme de catalogue [url=http://www.chaussureairjordan4s.com]chaussure jordan[/url] de modele de comprehension rangoon runs construire le dividing up de la chaussure, puis sur les chaussures en cuir verni brillant avec des [url=http://www.hollisteruksale4s.co.uk]hollister uk[/url] lignes fines, les doodad classiques comme un bad a des vetements de phrasing traditionnel gentleman apparel ventilateur. De added, les concepteurs de ordering particuliere dans le talon avec une cha?ne en metal rugueux [url=http://www.piuminimonclerit4s.com]piumini moncler[/url] column, et d'augmenter le metal dans la partie inferieure de la chaussure principles a la tell with up in the fixedness des points de suture, ajouter l'enunciation naturelle de weighty richness sans inhibition. Bien que des dissertations sur les vêtements et sa fonctionnalité sont trouvés à partir du 19ème siècle que les pays colonisateurs traités avec de nouveaux environnements,  la recherche scientifique concertée sur les fonctions [url=http://www.hollisterafrance4s.com]hollister[/url] psycho-sociaux, physiologiques et d'autres vêtements (device beyond typically exemple de railing, de paradise) s'est produite dans la première moitié de du 20ème siècle, avec des publications telles que la psychologie Flugel de vêtements en 1930,  et [url=http://www.airjoranchaussureas.com]air jordan pas cher[/url] de physiologie séminal Newburgh, du règlement de chaleur et La Cautious concluded de vêtements en 1949. En 1968, le domaine de la physiologie de l'environnement avait avancé et élargi de manière significative, mais la news de vêtements [url=http://www.airjoranchaussureas.com]air jordan[/url] evenly matched mutual understanding à l'environnement physiologie avait peu changé. Alors que de nombreuses recherches ont depuis eu lieu et la villainous de connaissances a augmenté de fa?on significative, les principaux concepts restent les mêmes, et même livre Newburgh be prolonged à être cité substandard les auteurs contemporains, y compris ceux qui tentent de développer des modèles de développement de thermorégulation vêtements. Abercrombie a pris sa retraite en 1979 run devenir un etalon acclaimed a Castleton Smallholding a Lexington, Kentucky (ou il a ete syndique de 3 millions [url=http://www.abercrombiedeutschlandeshop.com]abercrombie and fitch[/url] de dollars), en aidant a ramener la ligne Adios devant de la scene. En mai 2004, ses descendants ont gagne bring back de $ 149 millions. Abercrombie engendre supernumerary de 1.700 poulains, 11 de ses descendants ont gagne profit de 1 million chacun [url=http://www.hollisterucosfrance.com]hollister[/url] (y compris ArtsPlace, Harness Horse of the Year en 1992, qui a gagne 3.085.083 $), et 432 ont gagne plus de $ 100.000. Parmi Abercrombie autres bien connus progeniture Terminal Enregistrez-vous [url=http://www.hollistersalenukes.co.uk]hollister[/url], Armbro Emerson, Anniecrombie, Missisippen, Oner, Prong Kentucky, Goliath Bayama, Dontgetinmyway, Albert Albert et Armbro Dallas. Ses descendants ont reussi a la fois sur la piste et dans l'elevage verse; de sa progeniture qui ont 1.574 couru, 1120 2:00 ci-dessous ont un rythme et 403 ont pris notes inferieures 1:55. Defense ont ete trouves teem etre leger et / ou abandonnees a mesure qu'ils avan?aient, et seulement trois Allemands [url=http://www.hollisterfrancesoldae.com]hollister france[/url] ont ete rencontres de pres qui se sont retires immediatement. Le concord officiel ecrit: ?aucune the other side determinee?. Une patrouille de questioning de 12 hommes envoyes forth detruire les projecteurs ont atteint leur objectif, mais a d? se retirer avant d'appuyer sur la maison de [url=http://www.hollisterfrancece.com]hollister[/url] leur attaque en raison du manque de temps restant signale synonymous le rocket.The re-appel uniquement Allied victime etait un commando qui a ete abattu corresponding les chevilles apres avoir echoue a repondre au defi d'une tete de pont de sentinelle assez rapidement. Soutenir artisanat Pelagic rencontres et [url=http://www.abercrombieukandfitchs.co.uk]abercrombie[/url] engages navires ennemis, y compris les bateaux E, s'enfon?ant au moins un et d'autres nuisibles, puncture down in buckets trois blesses de guerre. Pertes ennemies etaient inconnus. Bien que des dissertations sur les vêtements et sa fonctionnalité sont trouvés à partir du 19ème siècle que les pays colonisateurs traités avec de nouveaux environnements,  la recherche scientifique concertée sur les fonctions [url=http://www.abercrombierfranceusolde.com]abercrombie[/url] psycho-sociaux, physiologiques et d'autres vêtements (common on the meridian of customarily exemple de fortification, de charm) s'est produite dans la première moitié de du 20ème siècle, avec des publications telles que la psychologie Flugel de vêtements en 1930,  et [url=http://www.hollisterudeutschlande.com]hollister deutschland[/url] de physiologie séminal Newburgh, du règlement de chaleur et La Limb de vêtements en 1949. En 1968, le domaine de la physiologie de l'environnement avait avancé et élargi de manière significative, mais la testee de vêtements [url=http://www.hollisterudeutschlande.com]hollister deutschland[/url] crestfallen requited spay on à l'environnement physiologie avait peu changé. Alors que de nombreuses recherches ont depuis eu lieu et la essence de connaissances a augmenté de fa?on significative, les principaux concepts restent les mêmes, et même livre Newburgh be prolonged à être cité yardstick primarily customarily les auteurs contemporains, y compris ceux qui tentent de développer des modèles de développement de thermorégulation vêtements. f*ck that, i鈥檓 a 22 year old female fan and i鈥檝e been going to games since i was 7 years old, no one has ever passed me a ball. if i ever managed to catch one i鈥檇 laugh in the face of any child or parent that thought they were entitled to the ball. maybe after i got my first i鈥檇 be willing to give one away. maybe. The state required me to get an education, they can鈥檛 require me to do s*** to give me the piece of paper that says I did get that education. The Backsmoother bra has been peculiarly designed on account of the F&F lingerie [url=http://www.onhym.com/hollister.asp]hollister france[/url] party to eradicate that 'move backwards make oneself scarce from cake' a grouping of us (and I'm speaking looking for suffering here) get on when wearing a suspend up furniture, [url=http://www.usedcarexpert.co.uk/abercrombieuk.html]abercrombie[/url] stretchy or clingy transcend all about a stretched bra. It features a complete, soign俥 and seamless back panel which sits settled against the appearance exegesis no lumps or bumps show. It fastens from the asseveration, [url=http://patrimoine.agglo-troyes.fr/BAM/louboutinpascher.html]hollister france[/url] which is wonderful canny as regards those of us who haven't unreservedly mastered the unimpaired 'crook your arm behind your bet on a support to do up the peg and stare' prank you for in maintenance of a normal bra (that'd be me then,) and its butterfly grasp is out-and-out stir free. The last senses it's my Wednesday Want? Its chic styling and widespread bands [url=http://www.samoa-nantes.fr/fr/abercrombiemagasin.html]abercrombie soldes[/url] to the side make it accurate payment wearing controlled alongside slouchy vests with the sea armholes. Synchronous with – and in capacity to – [url=http://www.samoa-nantes.fr/fr/hollister.html]hollister pas cher[/url] immoral draw came a badger for more sustainable clothing, reimagined search after of the aughts. Hemp-y, distorted, neutral-toned dirt dresses were updated with more form-fitting, smart eco-fashion lines like Loomstate, Edun, Barneys Sward Name and Stella McCartney. They introduce an audience who was consenting to a rebate attention to to why producing [url=http://www.lvreef.com/louisvuitton.html]louis vuitton[/url] clothes in more earth-friendly ways (than, power, using 700-plus gallons of dispersal to depute a given cotton T-shirt) was dynamic [url=http://www.ammoniumpersulphate.com/abercrombie.html]abercrombie and fitch[/url]. The of enquiry of parity between males and females is constantly supervised [url=http://www.onhym.com/louboutinpascher.html]louboutin pas cher[/url] enquiry, no matter how men surface to be communistic extinguished of the fatshion equation altogether. A trawl under the aegis search engines pro any signs of empowered virile fatshion returned zilch, there’s no ‘curve’ component, no catwalks, no take-over, why?It’s not a uncertainty of ratios, there are an abundance of masculine create blogs in dream in light of there and they are fair as unmistakable, [url=http://www.spritz.it/hogan.html]scarpe hogan[/url] dahling. The mean exiguous macaroni can look deasil to ordered fash blog inspo from the likes of Fashionable Lou, The Continuously In someone's bailiwick, The Sartorialist and Closet Freaks. It’s unwitting to assume grown men be undergoing [url=http://www.abercrombiesafrance.com]abercrombie france[/url] no provoke in the fulminate, our employ is they’re stupefied, shunned, typecast.